This article is about paying space travellers. For other commercial spacefarers, see Commercial astronaut. For entrepreneurial space ventures and colonization, see NewSpace. "Space tourist" redirects here. For persons in space other than professional astronauts, see Space flight participant. For the 2009 film, see Space Tourists. Space tourism is space travel for recreational, leisure or business purposes. There are several different types of space tourism, including orbital, suborbital and lunar space tourism. To date, orbital space tourism has been performed only by the Russian Space Agency. Work also continues towards developing suborbital space tourism vehicles. This is being done by aerospace companies like Blue Origin and Virgin Galactic. In addition, SpaceX (an aerospace manufacturer) announced in 2018 that it is planning on sending two space tourists on a free-return trajectory around the Moon on the upper stage of SpaceX's BFR rocket, known as the Big Falcon Spaceship (BFS). During the period from 2001 to 2009, the publicized price for flights brokered by Space Adventures to the International Space Station aboard a Russian Soyuz spacecraft was in the range of US$20–40 million. 7 space tourists made 8 space flights during this time. Some space tourists have signed contracts with third parties to conduct certain research activities while in orbit. By 2007, space tourism was thought to be one of the earliest markets that would emerge for commercial spaceflight. :11 Space Adventures is the only company that has sent paying passengers to space. In conjunction with the Federal Space Agency of the Russian Federation and Rocket and Space Corporation Energia, Space Adventures facilitated the flights for all of the world's first private space explorers. The first three participants paid in excess of $20 million (USD) each for their 10-day visit to the ISS. Russia halted orbital space tourism in 2010 due to the increase in the International Space Station crew size, using the seats for expedition crews that would previously have been sold to paying spaceflight participants. Orbital tourist flights were set to resume in 2015 but the one planned was postponed indefinitely and none have occurred since 2009. As an alternative term to "tourism", some organizations such as the Commercial Spaceflight Federation use the term "personal spaceflight". The Citizens in Space project uses the term "citizen space exploration". Many private space travelers have objected to the term "space tourist", often pointing out that their role went beyond that of an observer, since they also carried out scientific experiments in the course of their journey. Richard Garriott additionally emphasized that his training was identical to the requirements of non-Russian Soyuz crew members, and that teachers and other non-professional astronauts chosen to fly with NASA are called astronauts. He has said that if the distinction has to be made, he would rather be called "private astronaut" than "tourist". Dennis Tito has asked to be known as an "independent researcher", and Mark Shuttleworth described himself as a "pioneer of commercial space travel". Gregory Olsen prefers "private researcher", and Anousheh Ansari prefers the term "private space explorer". Other space enthusiasts object to the term on similar grounds. Rick Tumlinson of the Space Frontier Foundation, for example, has said: "I hate the word tourist, and I always will ... 'Tourist' is somebody in a flowered shirt with three cameras around his neck." Russian cosmonaut Maksim Surayev told the press in 2009 not to describe Guy Laliberté as a tourist: "It's become fashionable to speak of space tourists. He is not a tourist but a participant in the mission." "Spaceflight participant" is the official term used by NASA and the Russian Federal Space Agency to distinguish between private space travelers and career astronauts. Tito, Shuttleworth, Olsen, Ansari, and Simonyi were designated as such during their respective space flights. NASA also lists Christa McAuliffe as a spaceflight participant (although she did not pay a fee), apparently due to her non-technical duties aboard the STS-51-L flight. The US Federal Aviation Administration awards the title of "Commercial Astronaut" to trained crew members of privately funded spacecraft. The only people currently holding this title are Mike Melvill and Brian Binnie, the pilots of SpaceShipOne. The Soviet space program was aggressive in broadening the pool of cosmonauts. The Soviet Intercosmos program included cosmonauts selected from Warsaw Pact member countries (Czechoslovakia, Poland, East Germany, Bulgaria, Hungary, Romania) and later from allies of the USSR (Cuba, Mongolia, Vietnam) and non-aligned countries (India, Syria, Afghanistan). Most of these cosmonauts received full training for their missions and were treated as equals, but were generally given shorter flights than Soviet cosmonauts. The European Space Agency (ESA) also took advantage of the program. The US space shuttle program included payload specialist positions which were usually filled by representatives of companies or institutions managing a specific payload on that mission. These payload specialists did not receive the same training as professional NASA astronauts and were not employed by NASA. In 1983, Ulf Merbold from ESA and Byron Lichtenberg from MIT (engineer and Air Force fighter pilot) were the first payload specialists to fly on the Space Shuttle, on mission STS-9. In 1984, Charles D. Walker became the first non-government astronaut to fly, with his employer McDonnell Douglas paying US$40,000 (equivalent to $96,464 in 2018) for his flight. NASA was also eager to prove its capability to Congressional sponsors. During the 1970s, Shuttle prime contractor Rockwell International studied a $200–300 million removable cabin that could fit into the Shuttle's cargo bay. The cabin could carry up to 74 passengers into orbit for up to three days. Space Habitation Design Associates proposed, in 1983, a cabin for 72 passengers in the bay. Passengers were located in six sections, each with windows and its own loading ramp, and with seats in different configurations for launch and landing. Another proposal was based on the Spacelab habitation modules, which provided 32 seats in the payload bay in addition to those in the cockpit area. A 1985 presentation to the National Space Society stated that, although flying tourists in the cabin would cost $1 to 1.5 million per passenger without government subsidy, within 15 years 30,000 people a year would pay US$25,000 (equivalent to $58,238 in 2018) each to fly in space on new spacecraft. The presentation also forecast flights to lunar orbit within 30 years and visits to the lunar surface within 50 years. As the shuttle program expanded in the early 1980s, NASA began a Space Flight Participant program to allow citizens without scientific or governmental roles to fly. Christa McAuliffe was chosen as the first Teacher in Space in July 1985 from 11,400 applicants. 1,700 applied for the Journalist in Space program. An Artist in Space program was considered, and NASA expected that after McAuliffe's flight two to three civilians a year would fly on the shuttle. After McAuliffe was killed in the Challenger disaster in January 1986, the programs were canceled. McAuliffe's backup, Barbara Morgan, eventually got hired in 1998 as a professional astronaut and flew on STS-118 as a mission specialist. :84–85 A second journalist-in-space program, in which NASA green-lighted Miles O'Brien to fly on the space shuttle, was scheduled to be announced in 2003. That program was canceled in the wake of the Columbia disaster on STS-107 and subsequent emphasis on finishing the International Space Station before retiring the space shuttle. "Review the issues and opportunities for flying nonprofessional astronauts in space, the appropriate government role for supporting the nascent space tourism industry, use of the Shuttle and Space Station for Tourism, safety and training criteria for space tourists, and the potential commercial market for space tourism." The subcommittee report was interested in evaluating Dennis Tito's extensive training and his experience in space as a nonprofessional astronaut. With the realities of the post-Perestroika economy in Russia, its space industry was especially starved for cash. The Tokyo Broadcasting System (TBS) offered to pay for one of its reporters to fly on a mission. Toyohiro Akiyama was flown in 1990 to Mir with the eighth crew and returned a week later with the seventh crew. Cost estimates vary from $10 million up to $37 million. Akiyama gave a daily TV broadcast from orbit and also performed scientific experiments for Russian and Japanese companies. However, since the cost of the flight was paid by his employer, Akiyama could be considered a business traveler rather than a tourist. In 1991, British chemist Helen Sharman was selected from a pool of 13,000 applicants to be the first Briton in space. The program was known as Project Juno and was a cooperative arrangement between the Soviet Union and a group of British companies. The Project Juno consortium failed to raise the funds required, and the program was almost canceled. Reportedly Mikhail Gorbachev ordered it to proceed under Soviet expense in the interests of international relations, but in the absence of Western underwriting, less expensive experiments were substituted for those in the original plans. Sharman flew aboard Soyuz TM-12 to Mir and returned aboard Soyuz TM-11. As of 2018, no suborbital space tourism has yet occurred, but since it is projected to be more affordable, many companies view it as a money-making proposition. Most are proposing vehicles that make suborbital flights peaking at an altitude of 100–160 km (62–99 mi). Passengers would experience three to six minutes of weightlessness, a view of a twinkle-free starfield, and a vista of the curved Earth below. Projected costs are expected to be about $200,000 per passenger. Scaled Composites won the $10 million X Prize in October 2004 with SpaceShipOne, as the first private company to reach and surpass an altitude of 100 km (62 mi) twice within two weeks. The altitude is beyond the Kármán Line, the arbitrarily defined boundary of space. The first flight was flown by Michael Melvill in June 2004, to a height of 100 km (62 mi), making him the first commercial astronaut. The prize-winning flight was flown by Brian Binnie, which reached a height of 112.0 km (69.6 mi), breaking the X-15 record. Virgin Galactic aspires to be the first to offer regular suborbital spaceflights to paying passengers, aboard a fleet of five SpaceShipTwo-class spaceplanes. The first of these spaceplanes, VSS Enterprise, was intended to commence its first commercial flights in 2015, and tickets were on sale at a price of $200,000 (later raised to $250,000). However, the company suffered a considerable setback when the Enterprise broke up over the Mojave Desert during a test flight in October 2014. Over 700 tickets had been sold prior to the accident. A second spaceplane, VSS Unity, has begun testing. As of 2018[update], Blue Origin is developing the New Shepard reusable suborbital launch system specifically to enable short-duration space tourism. Blue Origin plans to ferry a maximum of six persons on a brief journey to space on board the New Shepard. The capsule is attached to the top portion of an 18-meter rocket. The rocket reached 66 miles during a test flight on April 29, 2018. This was the eighth test flight of the New Shepard as part of its entire developmental program. Blue Origin has not yet started selling tickets for this flight carrying passengers. Armadillo Aerospace was developing a two-seat vertical takeoff and landing (VTOL) rocket called Hyperion, which will be marketed by Space Adventures. Hyperion uses a capsule similar in shape to the Gemini capsule. The vehicle will use a parachute for descent but will probably use retrorockets for final touchdown, according to remarks made by Armadillo Aerospace at the Next Generation Suborbital Researchers Conference in February 2012. The assets of Armadillo Aerospace were sold to Exos Aerospace and while SARGE is continuing to be developed, it is unclear whether Hyperion is still being developed. XCOR Aerospace was developing a suborbital vehicle called Lynx until development was halted in May 2016. The Lynx will take off from a runway under rocket power. Unlike SpaceShipOne and SpaceShipTwo, Lynx will not require a mothership. Lynx is designed for rapid turnaround, which will enable it to fly up to four times per day. Because of this rapid flight rate, Lynx has fewer seats than SpaceShipTwo, carrying only one pilot and one spaceflight participant on each flight. XCOR expect to roll out the first Lynx prototype and begin flight tests in 2015, but as of late 2017, XCOR was unable to complete their prototype development and filed for bankruptcy. Citizens in Space, formerly the Teacher in Space Project, is a project of the United States Rocket Academy. Citizens in Space combines citizen science with citizen space exploration. The goal is to fly citizen-science experiments and citizen explorers (who travel free) who will act as payload operators on suborbital space missions. By 2012, Citizens in Space had acquired a contract for 10 suborbital flights with XCOR Aerospace and expected to acquire additional flights from XCOR and other suborbital spaceflight providers in the future. In 2012 Citizens in Space reported they had begun training three citizen astronaut candidates and would select seven additional candidates over the next 12 to 14 months. Space Expedition Corporation was preparing to use the Lynx for "Space Expedition Curaçao", a commercial flight from Hato Airport on Curaçao, and planned to start commercial flights in 2014. The costs were $95,000 each. EADS Astrium, a subsidiary of European aerospace giant EADS, announced its space tourism project in June 2007. At the end of the 1990s, MirCorp, a private venture that was by then in charge of the space station, began seeking potential space tourists to visit Mir in order to offset some of its maintenance costs. Dennis Tito, an American businessman and former JPL scientist, became their first candidate. When the decision was made to de-orbit Mir, Tito managed to switch his trip to the International Space Station (ISS) through a deal between MirCorp and US-based Space Adventures, Ltd. Dennis Tito visited the ISS for seven days in April-May 2001, becoming the world's first "fee-paying" space tourist. 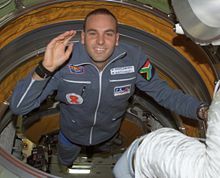 Tito was followed in April 2002 by South African Mark Shuttleworth (Soyuz TM-34). The third was Gregory Olsen in October 2005 (Soyuz TMA-7). In February 2003, the Space Shuttle Columbia disintegrated on re-entry into the Earth's atmosphere, killing all seven astronauts aboard. After this disaster, space tourism on the Russian Soyuz program was temporarily put on hold, because Soyuz vehicles became the only available transport to the ISS. After the Shuttle return to service in July 2005, space tourism was resumed. In September 2006, an Iranian American businesswoman named Anousheh Ansari became the fourth space tourist (Soyuz TMA-9).) In April 2007, Charles Simonyi, an American businessman of Hungarian descent, joined their ranks (Soyuz TMA-10). Simonyi became the first repeat space tourist, paying again to fly on Soyuz TMA-14 in March 2009. British-American Richard Garriott became the next space tourist in October 2008 aboard Soyuz TMA-14. As of 2018, Canadian Guy Laliberté is the most recent tourism to fly to the ISS, in September 2009 aboard Soyuz TMA-16. Since the Space Shuttle was retired in 2011, Soyuz once again became the only means of accessing the ISS, and so tourism was once again put on hold. Bigelow Aerospace acquired the designs for inflatable space habitats from NASA's Transhab program, and has already launched two first inflatable habitat modules. The first, named Genesis I, was launched in July 2006, and the second test module, Genesis II, was launched in June 2007. Both Genesis habitats remain in orbit as of 2018. Boeing is building the CST-100 Starliner capsule as part of the NASA CCDev program. Part of the agreement with NASA allows Boeing to sell seats for space tourists. Boeing proposed including one seat per flight for a space flight participant at a price that would be competitive with what Roscosmos charges tourists. Bigelow Aerospace plan to extend their successes with the Genesis modules by launching the BA 330, an expandable habitation module with 330 cubic meters of internal space, aboard a Vulcan rocket. The Vulcan, which is the only rocket under development with sufficient performance and a large enough payload fairing, is contracted to boost BA 330 to low lunar orbit by the end of 2022. Aurora Space Station A United States startup firm, Orion Span announced during the early part of 2018 it plans to launch and position a luxury space hotel to orbit within several years. This project remains in the preliminary stages. Aurora Station, the name of this hotel, will offer guests (maximum of six individuals) 12 days of staying in a pill-shaped space hotel for $9.5 million floating in the unexplored universe. The hotel’s cabin measures approximately 43 feet by 14 feet in width. Guests can enjoy non-space food and drinks for a small fee. In 2004, Bigelow Aerospace established a competition called America's Space Prize, which offered a $50 million prize to the first US company to create a reusable spacecraft capable of carrying passengers to a Nautilus space station. The prize expired in January 2010 without anyone making a serious effort to win it. The Space Island Group proposed having 20,000 people on their "space island" by 2020. In February 2017, Elon Musk announced that substantial deposits from two individuals had been received by SpaceX for a Moon loop flight using a free return trajectory and that this could happen as soon as late 2018. Musk said that the cost of the mission would be "comparable" to that of sending an astronaut to the International Space Station, about $70 million US dollars in 2017. In February 2018, Elon Musk announced the Falcon Heavy rocket would not be used for crewed missions. The proposal changed in 2018 to use the BFR system instead.In September 2018, Elon Musk revealed the passenger for the trip, Yusaku Maezawa during a livestream. Yusaku Maezawa described the plan for his trip in further detail, dubbed the DearMoon Project, intending to take 6-8 artists with him on the journey to inspire the artists to create new art. Elon Musk said he hopes BFR will be ready for an unpiloted trip to Mars in 2022. The crewed flight will follow in 2024. Space Adventures Ltd. have announced that they are working on DSE-Alpha, a circumlunar mission to the Moon, with the price per passenger being $100,000,000. Excalibur Almaz proposed to take three tourists in a flyby around the Moon, using modified Almaz space station modules, in a low-energy trajectory flyby around the Moon. The trip would last around 6 months. However, their equipment was never launched and is to be converted into an educational exhibit. The Golden Spike Company was an American space transport startup active from 2010–2013. The company held the objective to offer private commercial space transportation services to the surface of the Moon. The company's website was quietly taken offline in September 2015. The Inspiration Mars Foundation is an American nonprofit organization founded by Dennis Tito that proposed to launch a crewed mission to flyby Mars in January 2018, or 2021 if they missed the first deadline. Their website became defunct by late 2015 but it is archived by the Internet Archive. The Foundation's future plans are unclear. Under the Outer Space Treaty signed in 1967, the launch operator's nationality and the launch site's location determine which country is responsible for any damages occurred from a launch. After valuable resources were detected on the Moon, private companies began to formulate methods to extract the resources. Article II of the Outer Space Treaty dictates that "outer space, including the Moon and other celestial bodies, is not subject to national appropriation by claim of sovereignty, by means of use or occupation, or by any other means". However, countries have the right to freely explore the Moon and any resources collected are property of that country when they return. In December 2005, the US government released a set of proposed rules for space tourism. These included screening procedures and training for emergency situations, but not health requirements. Under current US law, any company proposing to launch paying passengers from American soil on a suborbital rocket must receive a license from the Federal Aviation Administration's Office of Commercial Space Transportation (FAA/AST). The licensing process focuses on public safety and safety of property, and the details can be found in the Code of Federal Regulations, Title 14, Chapter III. This is in accordance with the Commercial Space Launch Amendments Act passed by Congress in 2004. In March 2010, the New Mexico legislature passed the Spaceflight Informed Consent Act. The SICA gives legal protection to companies who provide private space flights in the case of accidental harm or death to individuals. Participants sign an Informed Consent waiver, dictating that spaceflight operators cannot be held liable in the "death of a participant resulting from the inherent risks of space flight activities". Operators are however not covered in the case of gross negligence or willful misconduct. A web-based survey suggested that over 70% of those surveyed wanted less than or equal to 2 weeks in space; in addition, 88% wanted to spacewalk (only 14% of these would do it for a 50% premium), and 21% wanted a hotel or space station. The concept has met with some criticism from some, including politicians, notably Günter Verheugen, vice-president of the European Commission, who said of the EADS Astrium Space Tourism Project: "It's only for the super-rich, which is against my social convictions". A 2010 study published in Geophysical Research Letters raised concerns that the growing commercial spaceflight industry could accelerate global warming. The study, funded by NASA and The Aerospace Corporation, simulated the impact of 1,000 suborbital launches of hybrid rockets from a single location, calculating that this would release a total of 600 tonnes of black carbon into the stratosphere. They found that the resultant layer of soot particles remained relatively localized, with only 20% of the carbon straying into the southern hemisphere, thus creating a strong hemispherical asymmetry. This unbalance would cause the temperature to decrease by about 0.4 °C (0.72 °F) in the tropics and subtropics, whereas the temperature at the poles would increase by between 0.2 and 1 °C (0.36 and 1.80 °F). The ozone layer would also be affected, with the tropics losing up to 1.7% of ozone cover, and the polar regions gaining 5–6%. The researchers stressed that these results should not be taken as "a precise forecast of the climate response to a specific launch rate of a specific rocket type", but as a demonstration of the sensitivity of the atmosphere to the large-scale disruption that commercial space tourism could bring. Several organizations have been formed to promote the space tourism industry, including the Space Tourism Society, Space Future, and HobbySpace. UniGalactic Space Travel Magazine is a bi-monthly educational publication covering space tourism and space exploration developments in companies like SpaceX, Orbital Sciences, Virgin Galactic and organizations like NASA. Classes in space tourism are currently taught at the Rochester Institute of Technology in New York, and Keio University in Japan. A 2010 report from the Federal Aviation Administration, titled "The Economic Impact of Commercial Space Transportation on the U. S Economy in 2009", cites studies done by Futron, an aerospace and technology-consulting firm, which predict that space tourism could become a billion-dollar market within 20 years. In addition, in the nearly two decades since Dennis Tito journeyed to the International Space Station, eight private citizens have paid the $20 million fee to travel to space. Space Adventures suggests that this number could increase fifteen-fold by 2020. These figures do not include other private space agencies such as Virgin Galactic, which as of 2014 has sold approximately 700 tickets priced at $200,000 or $250,000 dollars each and has accepted more than $80 million in deposits. ^ Eric Ralph (September 14, 2018). "SpaceX has signed a private passenger for the first BFR launch around the Moon". Retrieved September 14, 2018. ^ a b Grush, Loren (September 14, 2018). "SpaceX says it will send someone around the Moon on its future monster rocket". The Verge. Retrieved September 15, 2018. ^ Belfiore, Michael (2007). Rocketeers: how a visionary band of business leaders, engineers, and pilots is boldly privatizing space. New York: Smithsonian Books. ISBN 978-0-06-114903-0. ^ Schneider, Mike (July 18, 2007). "Int'l space station ticket price climbs". NewsOK. Archived from the original on April 30, 2013. ^ Boyle, Alan (June 13, 2006). "Regulators OK Oklahoma spaceport". MSNBC. Archived from the original on April 30, 2013. ^ "Russia halts space tours as U.S. retires Shuttle". Reuters. March 3, 2010. Archived from the original on April 30, 2013. ^ "Russia will restore space tourism since 2012" (in Russian). Interfax. March 18, 2010. ^ "Space Station Experience". Space Adventures. Retrieved October 27, 2017. ^ "Citizen Exploration". Citizens in Space. February 1, 2012. ^ "Do Not Call Me A Space Tourist!". Richard Garriot's Space Mission. January 31, 2008. Archived from the original on June 27, 2009. ^ Knight, Will (April 20, 2002). "'Space tourist' insists on pioneering role". New Scientist. Archived from the original on April 30, 2013. ^ Boyle, Alan (March 29, 2004). "Space millionaire to mix science with pleasure". MSNBC. ^ a b "About Anousheh Ansari". Anousheh Ansari (official website). Retrieved April 30, 2013. ^ Foust, Jeff (November 29, 2004). "Is it time to dump the t-word?". The Space Review. ^ "Circus man ready to make 'fairy tale' come true in space". Space Travel. September 10, 2009. Archived from the original on April 30, 2013. ^ "Biographical Data: Byron K. Lichtenberg, SC. D.". NASA. Retrieved on 2012-09-10 from http://www.jsc.nasa.gov/Bios/htmlbios/lichtenberg-bk.html. ^ "Astronauts: Ulf Merbold". European Space Agency. Archived from the original on April 30, 2013. ^ Citron, Robert (April 1985). "Space Tourism Could Drive Space Development". The Space Tourist. Fourth Annual L5 Space Development Conference, National Space Society. Washington DC: American Astronautical Society. pp. 85–771 to 85–774. Retrieved February 17, 2012. ^ Dubbs, Chris; Paat-Dahlstrom, Emeline; Walker, Charles D. (2011). Realizing Tomorrow: The Path to Private Spaceflight. University of Nebraska Press. ISBN 0-8032-1610-6. ^ Bridges, Andrew (November 1, 2000). "NASA: No Room at the ISS Inn for Mir Cast-offs". Space.com. Archived from the original on November 9, 2000. ^ "Toyohiro Akiyama: Cautionary tales from one not afraid to risk all". Japan Times. August 3, 2013. Retrieved July 31, 2018. ^ "World Aviation in 1990". Retrieved August 1, 2018. ^ "1991: Sharman becomes first Briton in space". BBC News. May 18, 1991. ^ "Scotland 2040: Spaceships head for Moon with lunar golfers and crater ramblers aboard". The Scotsman. October 12, 2006. ^ Said, Caroyln (September 28, 2004). "British tycoon wants to fly you to space: Virgin Galactic plans to sell $200,000 rides". San Francisco Chronicle. ^ "SpaceShipOne Flies Again Within 14 Days - Wins $10M X PRIZE" (Press release). Scaled Composites. Retrieved April 30, 2013. ^ "Michael W. Melvill". Scaled Composites. Retrieved April 30, 2013. ^ "SpaceShipOne Captures X-Prize!". Scaled Composites. Retrieved November 9, 2008. ^ Chang, Kenneth; Schwartz, John (October 31, 2014). "Virgin Galactic's SpaceShipTwo Crashes in New Setback for Commercial Spaceflight". The New York Times. ^ "New Shepard reaches space on eighth test flight - SpaceNews.com". SpaceNews.com. April 29, 2018. Retrieved October 16, 2018. ^ "The U.S. Commercial Suborbital Industry: A Space Renaissance in the Making" (PDF). US DOT's Federal Aviation Administration. pp. 6–7. ^ "About Lynx" Archived April 30, 2010, at the Wayback Machine. XCOR Aerospace. Retrieved April 30, 2013. ^ "XCOR Aerospace files for bankruptcy" SpaceNews. November 9, 2017. ^ "The Next Frontier For Citizen Science". Citizens in Space. May 5, 2012. ^ "Fliegen wir die Strecke New York-Tokio bald mit Umweg übers All?". Bild (in German). October 26, 2012. ^ "XCOR Aerospace Announces Space Expedition Corporation (SXC) As General Sales Agent For Space Tourism Flights". XCOR Aerospace. June 7, 2012. Archived from the original on April 1, 2013. ^ "Europe joins space tourism race". The Times. June 10, 2007. ^ Klotz, Irene (September 17, 2014). "Boeing's 'space taxi' includes seat for a tourist". Reuters. Retrieved August 6, 2015. ^ "Boeing space taxi has tourist seat". Canadian Broadcasting Company. Thomson Reuters. September 18, 2014. Retrieved January 7, 2017. ^ "Bigelow Aerospace and United Launch Alliance Announce Agreement to Place a B330 Habitat in Low Lunar Orbit". October 17, 2017. Retrieved January 9, 2018. ^ "A Space Hotel in Images: Orion Span's Luxury Aurora Station". Space.com. Retrieved October 16, 2018. ^ "Orion Span claims its "luxury space hotel" will open to its first guests in 2022 — Quartz". qz.com. Retrieved October 16, 2018. ^ Foust, Jeff (November 1, 2010). "Bigelow still thinks big". The Space Review. ^ "The Space Island Group's Mission". Space Island Group. Retrieved April 30, 2013. ^ "SpaceX to fly tourists around Moon". BBC News. February 27, 2017. Retrieved October 27, 2017. ^ Yuhas, Alan (February 28, 2017). "SpaceX to send two people around the moon who paid for a 2018 private mission". The Guardian. Retrieved March 2, 2017. ^ a b Foust, Jeff. "SpaceX no longer planning crewed missions on Falcon Heavy". Spacenews. Retrieved February 6, 2018. ^ Pasztor, Andy. "Elon Musk Says SpaceX's New Falcon Heavy Rocket Unlikely to Carry Astronauts". Wall Street Journal. Retrieved February 6, 2018. ^ "Watch Elon Musk announce SpaceX's first Moon passenger today at 6PM PT". The Verge. September 17, 2018. Retrieved October 16, 2018. ^ Gilman, Victoria (August 10, 2005). "$100 Million Moon Trip: Space Tourism's Hot Ticket?". National Geographic News. ^ "Fly me to the moon". The Economist. June 30, 2012. Retrieved August 21, 2015. ^ Owen, Jonathan (March 11, 2015). "Shooting for the Moon: time called on Isle of Man space race". The Independent. Retrieved April 19, 2017. ^ Borenstein, Seth (February 27, 2013). "Tycoon wants to send married couple on Mars flyby". Excite. Associated Press. Retrieved March 3, 2013. ^ Boucher, Marc (February 20, 2013). "The First Human Mission to Mars in 2018 (Updated)". SpaceRef. Retrieved February 28, 2013. ^ Sonnenberg, Max (February 23, 2013). "Millionaire space tourist planning 'historic journey' to Mars in 2018". The Space Reporter. Archived from the original on February 26, 2013. Retrieved February 28, 2013. ^ "Dennis Tito's Prepared Remarks Before Congress on Human Mars Mission at Parabolic Arc". Parabolicarc.com. November 20, 2013. Retrieved December 7, 2013. ^ "The Foundation". Archived from the original on October 13, 2015. ^ robert.wickramatunga. "The Outer Space Treaty". www.unoosa.org. Retrieved October 27, 2017. ^ "US draws up space tourism rules". BBC News. January 8, 2006. Retrieved May 24, 2012. ^ "Code of Federal Regulations: Title 14, Chapter III". U.S. Government Printing Office. Archived from the original on July 16, 2012. ^ Boyle, Alan (December 23, 2004). "Private-spaceflight bill signed into law". MSNBC. Archived from the original on April 30, 2013. ^ David, Leonard (October 3, 2006). "Space Tourism Survey Shows Cost, Access Key Selling Points". Space.com. ^ "EU official balks at space tourism". The Peninsula. June 15, 2007. Archived from the original on January 16, 2009. ^ a b Ross, Martin; Mills, Michael; Toohey, Darin (2010). "Potential climate impact of black carbon emitted by rockets". Geophysical Research Letters. 37. Bibcode:2010GeoRL..3724810R. doi:10.1029/2010GL044548. ^ Mann, Adam (October 22, 2010). "Space tourism to accelerate climate change". Nature. ^ Carter, Travis. "Vacation: The Final Frontier". NYU Livewire. Archived from the original on April 30, 2013. ^ "Space Tourism 1 Lecture". Robert A. Goehlich (official website). Retrieved April 30, 2013. ^ "The Economic Impact of Commercial Space Transportation on the U. S Economy in 2009" (PDF). Federal Aviation Administration. September 2010. p. 11. ^ Spotts, Pete (May 6, 2011). "A space tourism trip to the moon? It could happen by 2015". The Christian Science Monitor. ^ Daily Mail (November 1, 2014). "Ticket holders set to travel on Virgin spaceship show their support". Abitzsch, Sven (May 15, 1996). Prospects of Space Tourism. 9th European Aerospace Congress - Visions and Limits of Long-term Aerospace Developments. Aerospace Institute, Technical University of Berlin: Space Future Consulting. Manber, Jeffrey (2009). Selling Peace: Inside the Soviet Conspiracy That Transformed the U.S. Space Program. Burlington, Ont: Apogee. ISBN 978-1-926592-08-4. Wikimedia Commons has media related to Space tourism.